Psychedelic: It's a word that conjures images of stoned ’60s-style hippies with flowers in their hair noodle dancing to endless guitar solos. My New Oxford American Dictionary tells me it's an adjective "relating to or denoting drugs that produce hallucinations and apparent expansion of consciousness" and also "a style of rock music originating in the mid-1960s, characterized by musical experimentation and drug-related lyrics," or "denoting or having an intense, vivid color or a swirling abstract pattern: a psychedelic T-shirt," or let's just say tie-dye. I'm not sure how the word is defined by the organizers of the first ever The Future is Unwritten music festival. They declare, "Humboldt County has a proud history of churning out some of the best psychedelic rock music north of San Francisco," and they're celebrating that "rich music tradition," with a fest spanning three days and three venues with seven bands total: three out-of-towners, three locals, one ex-local. At Sunday's Willie Nelson show I ran into Roshawn from the band Machete, who play a Sunday show as part of the F/U festival. When I mentioned the psyche fest, he was confused. "We are not a psychedelic band," he said in no uncertain terms. Like a machete, the band is metal -- hard, sharp metal. "It's a loose term, but, yeah, we're psychedelic," said Pete Ciotti, guitarist for Yer Dog, who play the fest's first night. "I'd say we fall into the category, kind of in a Neil Young psychedelic style." The band started out playing country-ish rock a la Wilco or Exile-era Stones, then mutated into a spacier zone, but Pete and bassist Pat Quinn are the only carryovers from the original Y-Dog. "This is a new version of the band," said Pete, "new line-up, new CD in the works, slightly new sound." Yer Dog plays Friday, Sept. 5, for "Chapter One" of The Future is Unwritten in an all-ages bash at Big Pete's with another Arcata band, White Manna, who self-identify on MySpace as "garage/psychedelic/other." F/U moves to the Alibi Saturday for Chapter Two, with Ryan Jones returning to his old digs with the latest incarnation of the amorphous drone/psyche/ambient combo Datura Blues and a new album,Is it as it is, Brother? D.B. is paired with Mammatus from "the outer reaches of Santa Cruz County." As the band explains it, "Mammatus harness[es] instruments and amplifiers with the brave intent of transforming the natural beauty and massive fury that lies in the earth into acoustic energy. The sound that results from these explorations is an aural adventure, a sonic quest through the outer reaches of the natural and spiritual worlds." Hmm, sounds psychedelic to me. Absynth Quintet, named for a mind-altering liqueur, celebrate their new CD, Indigo Shoes, with an extravaganza at the Jambalaya Friday. (Likewise, there's a review in these pages.) The plan for the show, says Ryan Roberts: "We are going to play the whole album backwards." And yes, satanic messages will be revealed. Saturday at the Jam: Jacob Fred Jazz Odyssey, a big time "jazz/electronica/psychedelic" band, who I'd describe as a tripped-out jamband. Meanwhile, Humboldt Brews has a Friday/Saturday run by Cubensis, from SoCal, who I'm told is one of the top Grateful Dead tribute bands around. Following last year's annual KMUD Lu'ah, organizers and master cooks JJ and Cousin Mark retired, and retired the name with them. Then JJ, aka Keke Kanaka Kapakahi o’ Kaliponi, passed on to that great lu'ah in the sky. Sunday, the station is reviving the event, renamed the Aloha Barbeque and Slack Key Festival. Now held at Beginnings in Briceland, it will feature Aaron Mahi, Martin Pahinui and George Ku’o, the same Hawaiian slack key players as last year, and it's dedicated to JJ. Got a note from Celtophile George Z. re: another Beginnings event, an Irish concert on Thursday, Sept. 4, featuring One for the Road, "a new band made up of some of the best young players, two from the States, Dave Cory from Portland and Kira Ott from SoCal, and two from Ireland, Pat Egan and Mick Walsh." Same Thursday, CenterArts takes to the Plaza with a show at Mazzotti's featuring Austin's wild and crazy Americana/jug band/assault team Asylum Street Spankers. Since pregnancy is in the news of late, we'll note that lead singer Christina Marrs is expecting her third child and will begin maternity leave as soon as the Spankers return to Texas. Things have slowed at the Lil' Red Lion after a wild summer with tons of shows (and not enough patrons). I haven't heard who is coming of late, but James Harkins, formerly of The Invasions, dropped by with a flyer. He's debuting his solo act, James and the Junk Set, Friday at the Lion, playing guitar and a makeshift drum-kit. "Seriously everything came out of the junkyard or the recycling center," he tells me, adding, "I'm playing all the songs my bandmates wouldn't let me play because they weren't punk enough." Joining him, John Ludington, whose set at the Humboldt Folklife Fest's songwriter night totally impressed me, and new-in-town songwriter Steven Lee Wood. Bad Kitty Norm describes it as, "sort of a homecoming. Lightnin' Bill Woodcock was born in Eureka but left here as a toddler. The Lightnin' Woodcock Trio is a tongue-in-cheek mix of blues and punk rock." and they're playing Monday at The Pearl, if you're into that sort of thing. Redwood Jazz Alliance opens its fall season with a concert by the Donny McCaslin Trio on Tuesday, Sept. 9, in HSU's Fulkerson Recital Hall. I don't know much about McCaslin aside from the fact that he's been playing tenor sax since he was a teen, and he's a Berklee alum -- but the RJA folks have not hit a sour note yet, so I trust that he's the real deal. 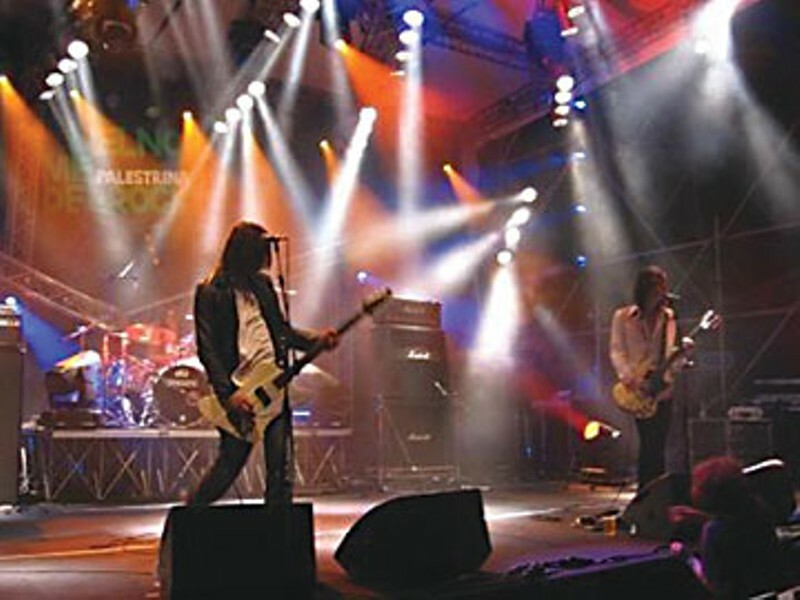 We told you about it months ago: iconic southern blues-rock band The Black Crowes and alt. psyche ex-locals Howlin Rain are playing the Van Duzer Wednesday, Sept. 10. There are plenty of tickets left in the balcony. Want seats on the floor? I can steer you to some online: $566 apiece, $1,132 for the pair. That's how good this show will be.